Posted by henry000 in anti-creationism, anti-ID, Christianity, creationism, evolution, faith, God, intelligent design, pope, religion, science, Vatican. The Pope has, for the first time as a Pontiff, spoken his view on the science of evolution, as shown in this report, which is bound to add fuels to the now re-emerging debate of evolution and “intelligent design” (ID for short). 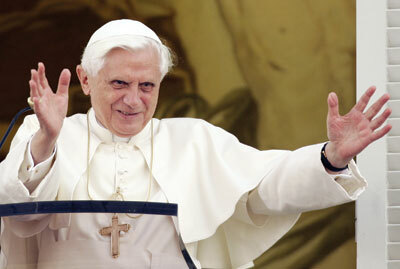 Pope Benedict has in general being rather vague on this issue. According to the report, the Pope seems to neither openly endorse ID nor completely disagree with evolution. This comes as no-surprise as the Vatican continues to hold the “theist evolution” view that evolution is perfectly capable to exist side-by-side with Catholic Christianity. Although difficult to interpret what the Pope is really saying from the report, it seems to me that although he thinks science provides a natural explanation, it is only part of a bigger picture (which he says cannot be explained by faith along), and evolution cannot take away a “dimension of reason”. “The process itself is rational despite the mistakes and confusion as it goes through a narrow corridor choosing a few positive mutations and using low probability,” he said. “This … inevitably leads to a question that goes beyond science … where did this rationality come from?” he asked. Answering his own question, he said it came from the “creative reason” of God. This Daily Mail news article provides an intriguing insight to the views of Pope Benedict on evolution. A cardinal by the name of Schoenborn has been mentioned several times in two of the reports. He seems to be the ID spokesperson for the Pope, as he openly supports ID. Schoenborn also has publicly dismissed the view of the late Pope John Paul II that evolution is “more than just a hypothesis” and that it is compatible with Christian faith. In order to express such views in public, Schoenborn must get permission from the Pope. This directly implies that the Pope, at least, is not opposing ID. Furthermore, as mentioned in the Daily Mail article, the sacking of the chief astronomer of the Pope, Father Coyne, in 2006 seems to be based on the fact that Father Coyne has openly showed his support for evolution as well as spoken out against Schoenborn. Any Catholic who believes in evolution is an ignorant, brainwashed fool. Any pope who believes in evolution is the King of Fools and one of Satan’s Little Helpers. Not only does evolution make a mockery of science, it makes a mockery of theology as well. Even the Village should be able to work out that the joke that is Darwinism isn’t a product of science, but a product of atheism. Welcome to … Evolution – a Fool’s Paradise and the Greatest Hoax in the History of Mankind.